But That Would Almost NEVER Happen, Would It? A young man in one of my classes, obviously trying to improve his A+ by sucking up to the teacher, mentioned that he had read my recent blog on the pigeon-hole principle. He went on to suggest that he really doubted the idea that 39 people could randomly seat themselves and ALL be in the wrong seat. "It just seems VERY unlikely." he suggested. Rather than tell him the answer, I set him the task of simulating the activity with a deck of cards. Pull out any suit, say the spades, and really shuffle the remaining cards well. Now we need to decide on an order for the remaining suits, so let clubs be the numbers one to thirteen in order from Ace, two, up to King for thirteen. Then the ace of diamonds can be 14, up through the King of diamonds for 26. Finally the ace of hearts is 27 up to the king of hearts for 39. Now turn over the cards and as you do count, one, two, etc... and if you get a card that is where it should be, stop.. they didn't all sit in the wrong chairs. You need not go on forever, just ten or so trials should give you an idea of whether the event is really, really uncommon, or not so very uncommon. I didn't tell him that I knew the probability, and that he should probably get three or four trials in a string of ten shuffles in which none of the cards landed in the right place. Such a mis-ordering of the cards was just the idea behind the first critical study of the idea we now call derangements by Leonhard Euler, the great Swiss mathematician. Euler was studying the probability of winning in the game of rencontre, now called "coincidences" in his paper "Calcul de la Probabilite dans le jeu de Rencontre", published around 1751. An English translation of the paper by Richard J. Pulskamp is available and the original document can be seen here. So what did Euler discover? Well for larger values of N, say 39 or so, the probability of having a perfect mis-sorting of the items approaches 1/e, or about 36.8%, more than a third of the time. It is not an unusual event at all. For smaller numbers you can find the probability by using the idea shown here for six items..
. This can be rewritten more easily using the factorial notation as P= 1/2! - 1/3! + 1/4! - 1/5! + 1/6! which is only a tiny bit above 36.8%, already very close to the 1/e value given above for the limiting value. If the number of items is even, the series will be a little more than 1/e, and if it is odd (and the last term is subtracted) then the probability will be a little below 1/e, with the propbability approaching 1/e as a limit as n gets greater and greater. 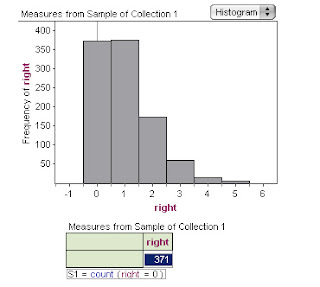 I decided to simulate a lot more times than would be practical with a deck of cards, so I cranked up Fathom, a wonderful simulation software by the folks at Key Curriculum, and had it repeat the experiment of seating the 39 people at random 1000 times, and then count how many landed in the right place. 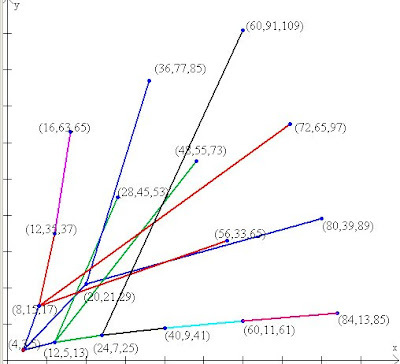 The results are shown in the graph below. It happened that no one landed in the right place 371 times.... Hmmmm, I guess Euler got it right. 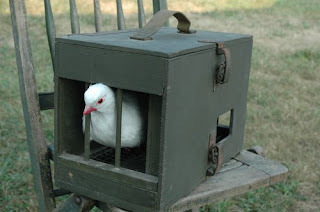 Sometimes problems that seem very hard, can be very easy if they are viewed in the right way, and one of those easy ways to make some hard problems manageable is the Pigeon-Hole Principle. Over the last few weeks seems like lots of problems invovling this idea have shown up, so I thought I would bring it to you. The basic idea is so easy any sixth grader would agree; if you have two boxes, and you are going to put three balls in the boxes, then at least one box will get more than one ball..... "well, Duh!" they answer... and yet... it seems easier to apply than it might be. Now that you know the secret, try these two problems. I'll post the answer down lower on the page where you must not look until you take a few minutes to ponder the problems. Here is the first from a recent blog I read: "39 people are attending a large, formal dinner, which must of course occur at a single, circular table. The guests, after milling about for a while, sit down to eat. It is then pointed out to them that there are name cards labeling assigned seats, and not a single one has sat in the seat assigned to them. 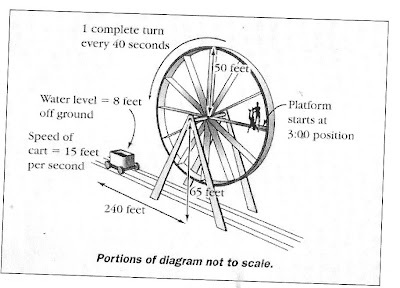 Prove that there is some way to rotate the table so that at least two people are in the correct seats." This one seems tougher, but really isn't, it just requires a different way of thinking. "Suppose you pick six unique integers from 1 to 1000. Prove that at least two of them must have a difference that is a multiple of five. Before I give you the answers, I will throw in a little cultural information that may amuse and entertain you. The same axiom is often named in honor of Dirichlet who used it in solving Pell's equation. In a discussion on a history group a few years ago Julio Cabillon added that there are a variety of names in different countries for the idea. His list included "le principe des tiroirs de Dirichlet", French for the principle of the drawers of Dirichlet, and the Portuguese "principio da casa dos pombos" for the house of pigeons principle and "das gavetas de Dirichlet" for the drawers of Dirichlet. It also is sometimes simply called Dirichlet's principle and most simply of all, the box principle. Jozef Przytycki wrote me to add, "In Polish we use also:"the principle of the drawers of Dirichlet" that is 'Zasada szufladkowa Dirichleta' ". You just can't have TOO many names for a really useful idea. Ok, The Proofs... for number one... Suppose you handed each person a number that was how many seats they needed to move to the right to find their assigned seat. Since no one is at the right seat, the number can not be zero or thirty-nine. SO each of the people has a number between 1 and 38...wait, there are 39 people...two of them (at least) must be the same distance away from their assigned seats.... admit it…..that’s pretty cool. For number two it is sort of the same idea, but you have to think about how much each number would have for a remainder if you divided them by five. The only possible choices are 0, 1, 2, 3, or 4... but there are six numbers, so two of them have the same remainder...and two numbers that have the same remainder on division by five, are a multiple of five apart.... think of 1,6, 11, etc for remainders of one. If you want to read more about how remainders can play a part in solving problems, see my blog on "casting out sevens"
Hey! Don’t Throw That Word Away, I’m Using It. It seems the people at Collins Dictionary are cleaning up the language for us. 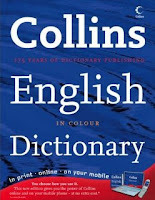 I recently read a publication on NY Times (on line) that said, in part; “Dictionary compilers at Collins have decided that the word list for the forthcoming edition of its largest volume is embrangled with words so obscure that they are linguistic recrement. Such words, they say, must be exuviated abstergently to make room for modern additions that will act as a roborant for the book." Among the list of words to be "exuviated" (exuviate,. to shed, such as a skin or similar outer covering) is Apodeictic (pronounced A pe dik' tic, at least by me… and my spell check wants that spelling to be apodictic, but that REALLY clobbers the Greek root word). The word means "Unquestionably true by virtue of demonstration". It’s a word I like to throw around in math classes. I mentioned in my last blog on Garfield that Lincoln took time off from his study of law to learn the proofs of all the propositions in the first six books of Euclid so that he could truly understand the meaning of "demonstrate". "I told myself, 'Lincoln, you can never make a lawyer if you do not understand what demonstrate means.' So I left my situation in Springfield, went home to my father’s house, and stayed there till I could give any proposition in the six books of Euclid at sight. I then found out what 'demonstrate' means, and went back to my law studies." The word comes from the Greek term deiktiko`s, serving to show or point out. The prefix “apo” can be confusing because it often means "away from" as in apothem, the measure in a regular polygon from the center to the midpoint of each side.. or as it is in aphelion, which lost its "o" over the years-- the point on its orbit when the Earth is farthest from the sun. For that matter apothecary and apology both have the same prefix. In the case of apodeictic, the apo means derived from; describing something for which its truth is derived from the demonstration. It is sort of like QED, but sounds REALLY impressive. Now why would they throw away a perfectly good word? You can find the rest of the story, and an interesting ending where I found it, at the blog, Let's Play Math by Denise, who calls herself a home school mom. The only thing I would add to her well written blog, is that Garfield was not just a politician, he was one of several presidents who came from a mathematical bent. Garfield actually was a professor of mathematics at Hiram College in Ohio for several years before being elected to the Senate in 1859. If you make a copy of Garfield's construction and rotate it 180o and put the two pieces together you get an image that was presented in a proof from a Chinese block print dating around 40 AD, and reputed by oral tradition to predate the life of Pythagorus in Chinese History. And why would I know so much about Garfield? His mother's name was Eliza Ballou, which makes her almost family. I came across this on a language blog, with the tempting title above... and went back to my youth when this had to be shown once or twice a year... It actually first came out 56 years ago, but surely I couldn't have seen it new. Not sure how long it has been since I have seen it... but ...well, the old saying is right..they just don't make 'em like they used to. When I was young, I found it amazing when I realized that there were an infinite number of primitive Pythagorean triples that had one leg that was one less than the hypotenuse. This was one of those tricks that you learned in popular math books, take any odd integer to serve as one leg, then square it and divide as evenly as possible to get the other leg and hypotenuse. For one leg of 7, the square is 49, and 49 can be almost evenly divided into 24 and 25, so 7, 24, 25 is a primitive triple. On the Barning tree I noticed that each of these was created by starting with P=(4,3,5) and applying the first matrix operation, AP gives (12,5,13), A2P gives (24, 7,25) and so on. In looking at the tree, I realized that each transformation matrix preserved one arithmetic difference in the three values. AP for any point P would preserve the difference between the first leg and hypotenuse. If we let P = (20,21,29) the difference is nine, and transformations by A preserve this so that AP = (80,39, 89) and A2P gives (176,57,185). If we wish to preserve the difference between the second and third value of the point, we transform by matrix C. Keeping P = (20,21,29) the transformation CP gives (36,77,85), and C2P gives (52, 165, 173). Matrix B then, preserves the difference between the legs. If we take (3,4,5) and repeatedly apply the transformation B, we get (21, 20, 29); (119, 120, 169); etc. I’m sure there is more hidden in the fabric of Barning trees, so if you see what I didn’t, drop me a line. It’s been a good weekend for Geometry for me. Several notes from folks telling me about geometry stuff I never knew… While I’m waiting on permission from the author of one, I wanted to tell you about the other.. 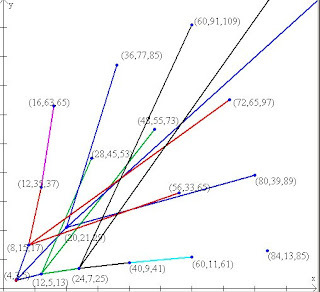 The graph (tree) below shows a set of Primitive Pythagorean triples… All the ones with hypotenuse less than 100. Primitive Pythagorean triples are right triangles that have all sides as integers and none of them have a common factor. What was new (to me) was that any one of them (and all the others not shown here) can be found as transformations of (4,3,5) using only three transformations. Let me make that clearer. If you think of a primitive Pythagorean triple as a point in three-space, then any other primitive Pythagorean triple is a point in three space that is just a transformation of this one… but there are only three transformations needed to get ALL of them. The tree shows which ones are generated by which ones, but you need to crank out the calcualtor and do some of these to see how neat it really is. This type of graph is called a Barning-Tree because it seems to have first been discovered by F. J. M. Barning, “On Pythagorean and quasi-Pythagorean triangles and a generation process with the help of unimodular matrices, (Dutch) Math. Centrum Amsterdam Afd. Zuivere Wisk, ZW-011 (1963) 37 pp.. If you take the three matrices below, and write any of the primitive triples as a column vector, then multiplying by any of the matrices will give you another unique triple.. they never duplicate one, and they don’t leave any out (OK, I’m taking that on faith as I haven’t proven it for myself yet). I think that is kind of wild, and am totally impressed with people who can notice stuff like that. 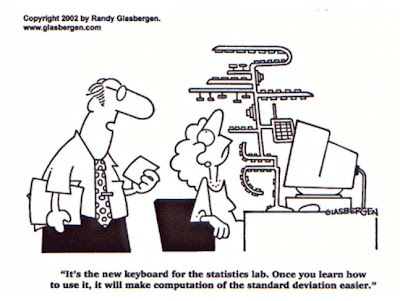 After my recent posts (here and here) about standard deviations, Dan Yates (he is the Y in YMS) sent me his version of a standard deviation machine, shown below. Ok, Dan is a really creative guy, but he didn't actually create that one. Randy, the guy who did, however, was a nice guy and let me post a copy here. Thanks, Randy. He has a lot of funny stuff at his web site, so please go there to view them. I’ve always been interested in the methods of graphic solutions to equations. Fortunately, over the years Dave Renfro has been willing to keep me in mind when he runs across old journal articles and send me copies, dozens over the last few years on just this topic. 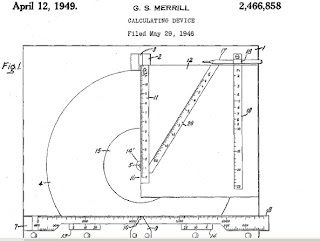 So, when I found a patent for a mechanical machine that would do standard deviations, I thought there had to be a graphic method also. I set about trying to construct one, and what follows is one such method. I have confined myself to three points, but the method would generalize to any number of data values. 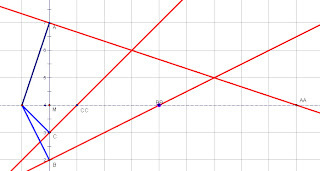 Clever observers will have noticed another point on the graph at (-1,4), one to the left of the mean point, M. We will use this point to square the length of the deviation of A (the distance from M to A). To Do this we make MA the mean proportional between 1 and MA2. This can be easily done by the method of similar triangles. We make a line from the point one left of M to point A to complete a right triangle. Then if we construct a perpendicular to this line at A, it will intersect the line through the mean at a new point I call AA. The distance M to AA is the square of the length MA.. we have found the square of the deviation of point A. Now we just need to transpose this line to another graph for safekeeping where we will add it to the other squared deviations. We repeat the previous process with points B and C, and copy each of the lengths sequentially onto a line, thus finding the sum of the squares of the deviations. Now we employ similar triangles again to find the mean of the sum of the squares of the deviations. We need to divide the length of the sum (Origin to CC) by n=3. To do this we drop a perpendicular from one end of the line (0-CC) that is three units long. We connect the far end (CC) to the other end of the three unit line(see figure below) and then construct a parallel to O-CC one unit away from the end. By the properties of similar triangles, we know that P-MSS is the Mean of the sum of the squares (O-CC divided by three)… we have found the variance. Now all that is left is to take the square root, and we do this by reversing the method we used to find the square of the deviations, we find the mean proportional between P-MSS and one. So we construct a point one to the left of the segment )-MSS and then bisect this new segment to find the center. Now we create a circle with a centered at this midpoint and using the MSS + 1 as a diameter. The positive distance from where this point crosses the x-axis to the point P is the standard deviation of the three points… Which I have calculated out with two decimal points accuracy…(although I used a negative sign …Oops).. . The method would be the same, of course for any number of points. The totient of an integer, N, is the number of integers Less than N which are relatively prime to N, that is, they share no common factors. The symbol for the Totient (by the way, the word is pronounced to rhyme with "quotient"... I didn't know that for a long time) of N is usually the greek letter Φ. We would write Φ(10)=4, to indicate there are four numbers less than 10 which have no factor in common with the number ten. The four numbers 1,3,7, and 9 are called the totitives of 10. The image at top shows a graph of Φ(n) for each n.
Euler showed that if a number n had prime factors p, q, and r; then the totient would equal N(1-1/p)(1-1/q)(1-1/r). It doesn't matter if it has some prime factors more than once, you only use each factor once in the calculation. As an example, 20 factors to 2x2x5, but the number of prime factors is found by 20 (1-1/2)(1-1/5) = 8; with totatives of 1, 3, 7, 9, 11, 13, 17, and 19. The word totient is drawn from the Latin root tot for "so much", and probably to the Greek tosos, "so great". The word tot is still used occasionally for a mark made beside a list to acknowledge receipt, and is sometimes called a "tot mark"(pronounced with a long o, like tote). Euler defined the rule for the number of totients around 1761 in proving what we now call the "Euler-Fermat" theorem. Euler didn't use the word totient. That term was introduced by J J Sylvester, (According to Graham, Knuth and Patashnik, "Concrete Mathematics") who had a habit of making up new words for math terms. "The reference they give is to a paper from 1883: "On the number of fractions contained in any 'Farey series' of which the limiting number is given". The name "PHI" for the function was created by Gauss in his Disquitiones arithmeticae . There is actually an interesting unproven math theorem about totients. It seems that any number that appears in the sequence of Φ(N) must appear at least twice. It has been proven that if there is an exception, it must have more than 10,000 digits. This is sometimes called the Carmichael Conjecture after R. D. Carmichael. I sent off notes to all my ususally clever friends, and eventually one of them turned me on to Ms. Peggy Kidwell, the curator of mathematics at the Smithsonian Museum... now aren't you impressed that the Smithsonian has a curator for Math... I'm impressed. It turns out that this question was right down Ms. Kidwell's alley. She is a co-author of Tools of American Mathematics Teaching, from the Johns Hopkins University Press, which is brand new this year. Ms. Kidwell wrote, "I have never seen this particular device. It has some similarity to an instrument, patented in 1864, that had a series of rotating slats, with several digits painted on each side of each slat. By rotating the slats and marking off problems with a thread, teachers could provide a wide range of arithmetic problems. The inventor of this “arithmetical frame,” a teacher named Henry K. Bugbee, even provided a written Key which gave answers to the questions." She went on to add that,The arithmetical frame was slightly modified by John Gould in the 1880s. For an image, see here." I even went on to suggest that the machine Sal had sent me pictures of would allow the teacher to pull down the shades over some of the digits to reduce the difficulty of a problem for different levels or ages of students. So not a bad day all in all, I learned a little about the history of math education, and one note struck me as particularly interesting that I found on the Smithsonians site for the image above. It said, ". It was very popular in Catholic schools in New York State." 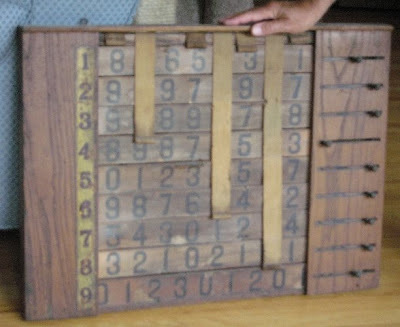 It seems very strange to me that parochial schools would have been more attracted to a particular type of math teaching machine than public, or other private schools... Guess you really do learn something everyday. Provided with an unlimited water supply, a 5-gallon jug, and a 3-gallon jug, measure outprecisely 4 gallons, by filling and emptying the jugs." If you have never tried this problem, you might pull out the pencil and paper and have a go before you read on. In a graph theory variant of this problem, the unlimited supply is often replaced with an eight gallon jug, but the problems are equivalent. I had just hours before read the same problem in reviewing Nets, Puzzles, and Postmen by Peter M. Higgins. Simonson goes on to describe a little history of the problem, "Of course this puzzle was not invented for this movie. Most references attribute the puzzle and its variations to Tartaglia [Tweedie, M.C.K., A Graphical method of Solving Tartaglian Measuring Puzzles, Mathematical Gazette, 23, (1939) 278-282. ], but the earliest known version of the problem occurs in the "Annales Stadenses" compiled by Abbot Albert of the convent of the Blessed Virgin Mary in Stade. Stade is a small city on the west side of the Elbe estuary a bit downriver from Hamburg. The date of compilation is uncertain, but seems to be 1240." "The puzzle is also discussed in detail at the wonderful educational mathematics site cut the knot created by Alex Bogolmony ". “Siméon Poisson's family tried to make him everything from a surgeon to a lawyer, the last on the theory that he was fit for nothing better. One or two of these professions he tackled with singular ineptitude, but at last he found his métier. It was on a journey that someone posed to him a problem similar to the one below (above on this page - AB). Solving it immediately, he realized his true calling and thereafter devoted himself to mathematics, becoming one of the greatest mathematicians of the nineteenth century." ahhhh now you wonder how many young people discovered their love for mathematics in a darkened theater as they shouted out help to Willis and Jackson, "No, Fill the three and dump it into the five!". The graphic NET for the problem is in the photo at the top. Imagine the points x,y as giving the amount in each of the two jugs. The x-coordinate shows how much is in the five-gallon jug and the y-coordinate shows how much is in the three-gallon jug. 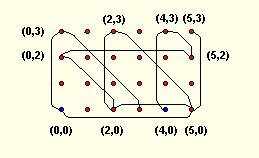 Each of the paths on the graph shows a possible move. For instance, if we start at (0,0) nothing in the two jugs, there are two paths we may follow, rigth out the x-axis to the point (5,0), or vertically up the y-axis to (0,3). The object is to end up at (4,0) or (4,1) or (4,2) or (4,3) since each of these will have a jug containing four gallons. To solve it, just move along the lines from point to point and if you get stuck, go back a point and take a different path. In the language of the graph-theory people, this is called a breadth first search (I think). Have fun, but keep in mind you may be learning important math along the way. Simonson points out the reason for his including the puzzle in his work, "This puzzle is useful for studying public-key cryptography, because the solution embodies the two major related number-theoretic results: Euclid’s algorithm [I just realized I have never written up anything on this, perhaps because so much has been done so well in other places, like this page ] and Fermat’s Little Theorem. seems to be the first to use any other values, e.g. halving 12 using 7 and 5. Tartaglia seems to be the first to divide in thirds, e.g. divide 24 in thirds using 5, 11, 13. The general problem of what can be obtained from a, b, c with c full to start seems to be first treated by A. Labosne is his 5th ed. of Bachet's Problemes and appears to still be unsolved when c < a+b." So have a go children!!! 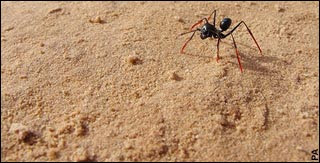 "A bizarre experiment that involved putting ants on stilts has demonstrated that they count paces to measure distances. Researchers know that desert ants use light cues from the sky to orient themselves on their journeys back to their nests but how they determine exact distances has been uncertain." "Drs Matthias Wittlinger and Harald Wolf at University of Ulm, Germany, and Prof Rudiger Wehner in Zurich, altered the legs on a group of ants to test the idea that they use stride length." "Some had pig bristles glued on to their legs, while others had legs shortened by amputation (Yikes, is there a society for the prevention of cruely to myrmex?). First some marched on normal legs to a feeder, where they were placed on stilts and sent home. The stiltwalkers misjudged the 10-metre distance back and overshot the nest entrance.When the experiment was repeated with the short-legged ants, they reached their goal too early, the scientists report today in the journal Science." Solve the fuel crisis, Raise Federal Gas Taxes??? 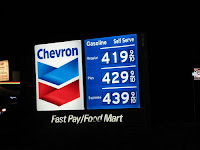 Ok, Greg Mankiw is a Harvard Economics prof, so he ought to know what he's doing; but I was reading one of his old blogs (2006) and he had the audacity to suggest raising the Federal Gas Tax by $1.00 a gallon...Yikes, how do you feel about $5.00 a gallon oil? "The environment. The burning of gasoline emits several pollutants. These include carbon dioxide, a cause of global warming. Higher gasoline taxes, perhaps as part of a broader carbon tax, would be the most direct and least invasive policy to address environmental concerns. "Road congestion. Every time I am stuck in traffic, I wish my fellow motorists would drive less, perhaps by living closer to where they work or by taking public transport. A higher gas tax would give all of us the incentive to do just that, reducing congestion on streets and highways. "Regulatory relief. Congress has tried to reduce energy dependence with corporate average fuel economy standards. These CAFE rules are heavy-handed government regulations replete with unintended consequences: They are partly responsible for the growth of SUVs, because light trucks have laxer standards than cars. In addition, by making the car fleet more fuel-efficient, the regulations encourage people to drive more, offsetting some of the conservation benefits and exacerbating road congestion. A higher gas tax would accomplish everything CAFE standards do, but without the adverse side effects. "Tax incidence. A basic principle of tax analysis -- taught in most freshman economics courses -- is that the burden of a tax is shared by consumer and producer. In this case, as a higher gas tax discouraged oil consumption, the price of oil would fall in world markets. As a result, the price of gas to consumers would rise by less than the increase in the tax. Some of the tax would in effect be paid by Saudi Arabia and Venezuela" Translation, Even with a dollar tax added, the price won't go up a dollar total because of supply-demand pressures. "Economic growth. Public finance experts have long preached that consumption taxes are better than income taxes for long-run economic growth, because income taxes discourage saving and investment. Gas is a component of consumption. An increased reliance on gas taxes over income taxes would make the tax code more favorable to growth. It would also encourage firms to devote more R&D spending to the search for gasoline substitutes." So come on people, pick up those phones and call your congressman/woman.. and tell them if they don't get off their butts and raise taxes, your gonna vote 'em out of there.... bet that one will wind their clocks a bit! OK, so I'm going to write about it and I'm on the net searching for the blog??? where did it go? Sorry someone, would love to find your blog again... The guy (I think) teaches a course that seems to be all problem driven (I think I would really like that) and I would love to find out more... Help!! OK, if you grew up in the huggy-feely school of education that says there is no such thing as a stupid question or a wrong answer... forgive me.... but I disagree.. I know. I'm a bad, bad, man... but I love it.